520 Sprocket Conversion Kit for Duc 1199/1299 with DID Chain! 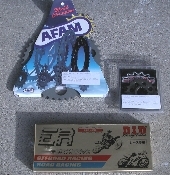 AFAM 520 Sprocket Conversion Kit for 1098/1198 with DID Chain! The last Axle Tool you will ever need! No wimpy Aluminum or cheap Chromoly here, no sir this is Stainless Steel. DID ZVM-X 520 Gold Street Chain Rated by DID to 1200cc's and only weighs .3 of a lb more than the DID ERV3 520 chain which in my opinion is the industry standard for 520 race chain.